President Trump blinked. The 35-day partial government shutdown appears to be ending. From the start of the shutdown, congressional Democrats said they would not negotiate regarding Trump’s proposal for a border wall until the government reopened. Trump said he would not agree to legislation opening the government unless it included money for the border wall. That standoff lasted until Friday. Congress is expected to pass a bill that funds the government through Feb. 15 and does not include wall money, and Trump said that he would sign it in a Rose Garden address. The public response had clear effects in Congress. Congressional Republicans had been unified behind the president in the early stages of the shutdown, but cracks started to emerge as it dragged on. In public, this was demonstrated on Thursday by six Senate Republicans voting for legislation put forward by Senate Democrats that would fund the government without money for the wall. And, in private, disagreement with the president’s strategy extended beyond those six. A meeting between Senate Republicans and Vice President Mike Pence on Thursday reportedly turned into a venting session, with some senators scolding Pence for the White House’s strategy. Among the critics was Majority Leader Mitch McConnell, who has the power to bring forward legislation, whether Trump likes it or not. We don’t know much about the private discussions between McConnell and the White House, but it’s possible that Trump folded in part because McConnell suggested Senate Republicans would likely move forward soon with legislation funding the government without paying for the wall — with or without the president’s support. Although Trump, in a Rose Garden speech on Friday, acted as if it were his decision to end the shutdown, the decision to fold may not truly have been Trump’s to make, and the speech may have been McConnell allowing the president to save face and concede before the Republicans in the Senate fully broke with him. To be clear, it’s not certain that Trump has lost the broader fight over the wall. It’s hard to see congressional Democrats offering much funding for it, but maybe they will agree to some kind of compromise that includes a few billion dollars. (I wouldn’t bet on this, as liberal Democratic opposition to the wall seems to be hardening.) Or, as he suggested on Friday, Trump could declare a national emergency and reallocate funds from other parts of the government to finance a wall. Such a move will almost certainly draw legal challenges. But Trump might win in the courts, as he (eventually) did on his executive order banning travel from certain countries into the United States. For now, however, we’re back to where we were when the shutdown began. Trump and Congress have three weeks to figure out a solution. In public, at least, all sides are staking out the same positions they held when the shutdown started. Trump will likely need a different strategy going forward. 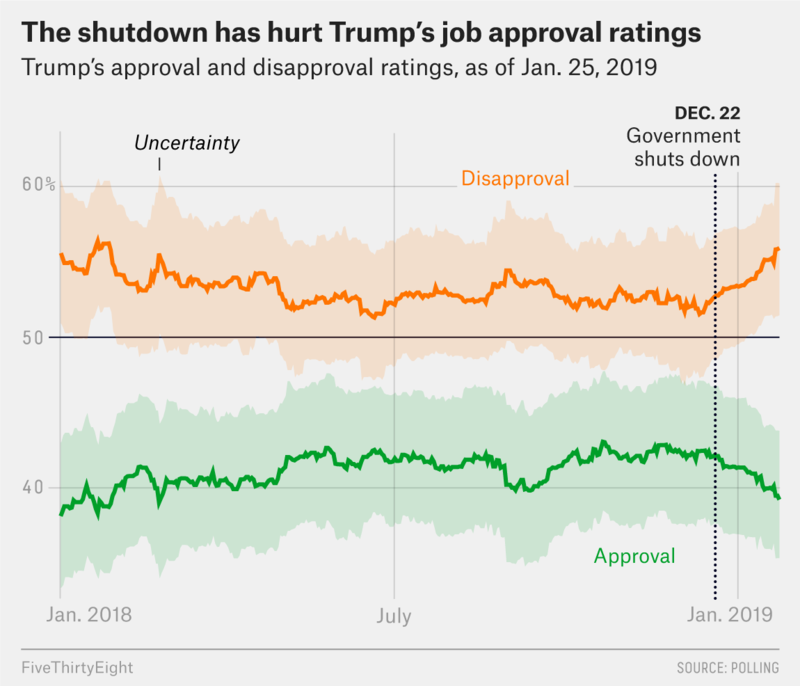 The one he employed over the last month — shutting down the government (which is unpopular) to get the wall (which is unpopular) — could not keep his party united forever. In short, it was another example that Trump is not immune to broader political dynamics, despite his surprising win in 2016. The health care policy legislation he was pushing for much of 2017 was deeply unpopular — and it failed. He had high disapproval ratings going into the 2018 midterms — and his party lost a ton of House seats. 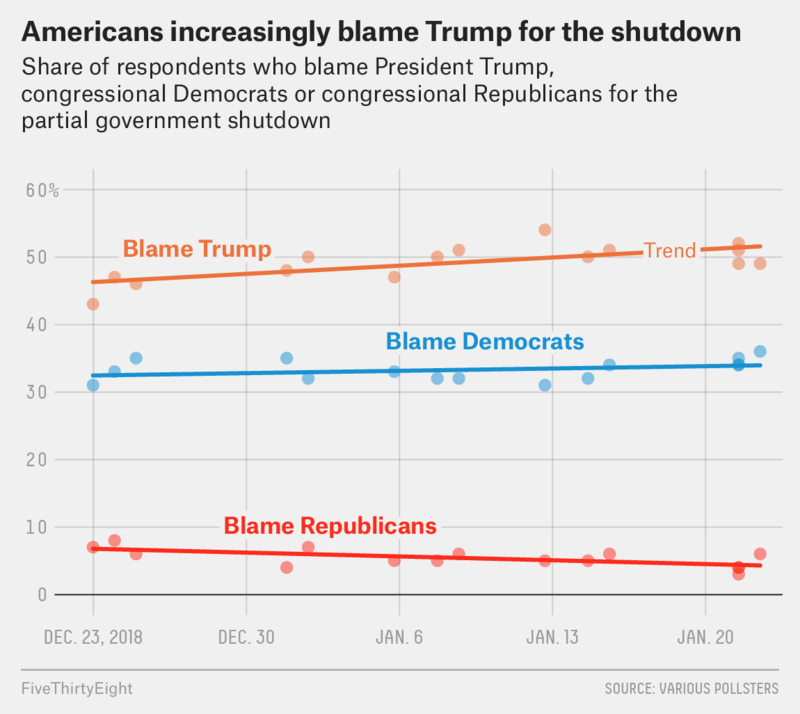 And now, he pushed a shutdown strategy that seemed doomed to fail — and it did. Politics Podcast: Will Pelosi Be Replaced? You can listen to the episode by clicking the “play” button in the audio player above or by downloading it in iTunes, the ESPN App or your favorite podcast platform. If you are new to podcasts, learn how to listen.